Following the critically-acclaimed and highly-rated series THE SIXTIES, CNN, PLAYTONE and HERZOG & COMPANY in association with HBO are producing an eight-part documentary series that will explore an equally consequential decade: the 1970s. 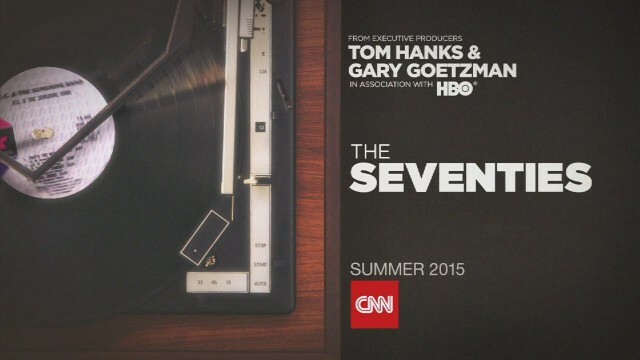 The non-scripted series, THE SEVENTIES, will be executive produced by multiple EMMY® Award-winning producers Tom Hanks and Gary Goetzman (HBO’s John Adams and The Pacific), and EMMY® Award-winning producer Mark Herzog (History’s Gettysburg) of Herzog & Company (HCO), as a CNN Original Series for CNN/U.S., it was announced today. THE SEVENTIES will pick-up where the 1960’s left off, examining the decade through its politics, culture and historic events. The inaugural episode, titled Television of the ‘70s, will guide viewers through the social currents of the time, reflected in shows like M.A.S.H., All in the Family, and The Mary Tyler Moore Show. It will also examine the establishment of two of the most successful franchises in television history: Monday Night Football and Saturday Night Live. The subsequent seven, one-hour episodes will delve into everything from the impact of the Vietnam War to the unprecedented scandal of Watergate. Episodes will also cover the evolving music scene of the decade, the Iran Hostage Crisis, the sexual revolution, and the rise in terrorism at home and abroad, including the massacre at the Munich Olympics, and the kidnapping of Patty Hearst. Archival and rarely-seen film, video and photographs will document the reality of this significant decade. Similar to THE SIXTIES, expert commentary from renowned historians will be woven throughout to add context while observations from today’s political and cultural leaders will add unique insight and perspective into a decade as extraordinary as the one that preceded it. The announcement of THE SEVENTIES comes days before CNN/U.S. airs a marathon of THE SIXTIES, beginning on Saturday, November 22nd at 7pm. Among the 10 episodes to re-air is the two hour Special for the series titled THE SIXTIES: The Assassination of President Kennedy, which received two Emmy nominations including Outstanding Documentary or Non-Fiction Special. Viewers can find more information on THE SIXTIES and episode guides by visiting www.cnn.com/thesixties. About CNN Original Series: The CNN Original Series group develops non-scripted programming for television via commissioned projects, acquisitions and in-house production. Amy Entelis, senior vice president of talent and content development, oversees CNN Original Series and CNN Films for CNN Worldwide. Vinnie Malhotra, senior vice president of development and acquisitions, works directly with filmmakers and producers to develop original projects for CNN Original Series and CNN Films.